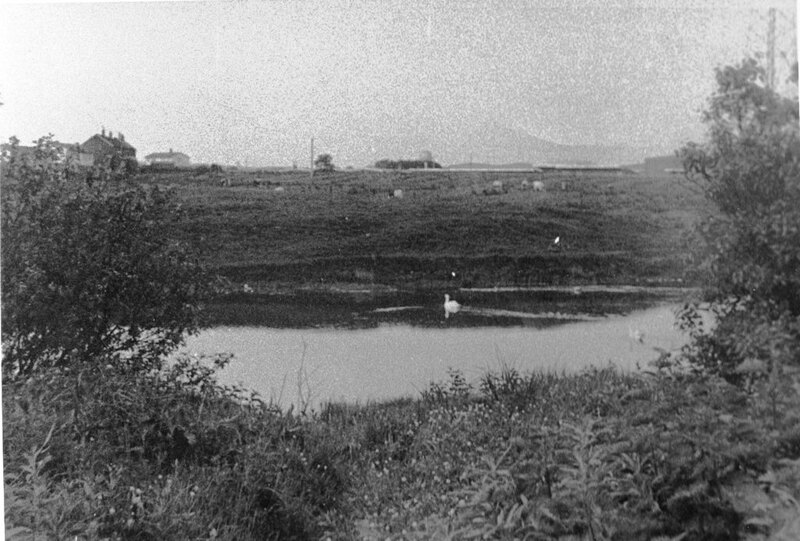 The picture of the pond on the page about the drowned bank clerk fascinated me. It looked familiar, but not quite right. I think it’s been printed backwards, i.e. a mirror image. This is the photo reversed. So, that would be the farm buildings in the upper left with no Addiewell houses left standing. In the far distance I think that’s the main shale bing from the old oil works. So this would be a view looking eastwards towards where the old garden allotments were in front of Davy and Stephenson streets. This all seems a bit picky but I spent a lot of time at the pond and the pictures are stuck in my head. The swan pair were there every summer producing 3 to 5 cygnets. We’d occasionally annoy them with the dog barking at the waters edge or by throwing some stones. We soon learned that the adult swans were not intimidated and chased us up the bank with the huge wingspan flapping and the beak ready to bite. The pond would freeze in the cold winter weather but the ice was rarely strong enough for walking on. We went through the ice a few times but only at the waters edge. Got wet and cold but no disasters. The pond froze hard one winter and I saw somebody ice skating there. My memory tells me it was one of the Davidson boys. You once asked me about a house (manor house?) that was situated between the farm and Breich Water. Like a repressed memory, I rememberthere was the ruin of an old building on the way to the burn. Just a corner and ruined walls. The ruin and the yard around it was full of trees and shrubs. We never inspected it further. This page was added by David Toynbee on 29/12/2014.